Sony the very famous brand highly known for its quality products that are high in price too , but now sony comes with Sony DSC H200 with attractive specs . Sony DSC H200 Cyber shot comes with 20.1MP image sensor and 26X optical zoom with 52X digital zoom . Sony DSC H2oo has 3ich lcd display . The image sensor used on the Sony DSC H200 is Super HAD CCD . Sony DSC H200 has many things which makes it more than a standard camera we will talk them in their respective sections . Sony cyber shot DSC-H200 is successor to DSC H100 . Sony DSC H200 looks like a dslr camera because of its body design . If you look the camera from from it look more premium then the rear of the camera . At the rear of Sony DSC H200 there are 8 tactile buttons for different purposes . On the top of desk the device has power on/off buttor , shutter button with zoom controller & mode dialer . 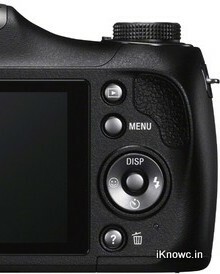 The flash is and the mic for audio recording is also located on the top of the device . Sony DSC H200 has 3.0 inch Lcd Display at the rear with 460 Dots . Design and look of Sony DSC H200 seems to be robust . WHATS NEW in Sony DSC H200 Cyber shot ? Sony did many changes in H200 if we compare it to H100 . Resolution of the H200 is 20MP whereas the H100 has 16MP . 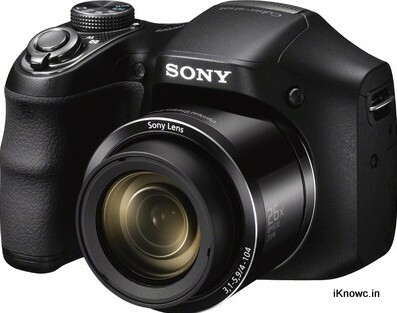 Also optical zoom is also increased from 21X to 26X in Sony DSC H200 . Sony DSC H200 body weights 430gram which is 15gram more than that H100 . Sony DSC H200 has minimum shutter speed of 2sec where as it is 15 sec in H100 . SONY DSC H200 has Super HAD CCD Sensor with 20.1MP resolution . So SONY DSC H200 image sensor promise you to deliver good image quality . Sony image quality is would be much better than its competitors . Sony DSC H200 can record video upto 720p resolution . Sony does a thing which is really great that is they included Optical SteadyShot image stabilization which help to record clear , smooth and blur free video . As we already tell you about the image sensor and its resolution that is Super HAD CCD Sensor with 20.1MP resolution . 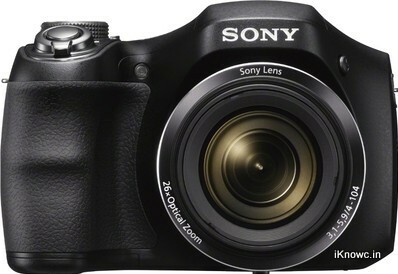 Sony DSC H200 has 26X optical zoom as well as 52X Digital zoom . SONY DSC H200 has inbuilt memory of 55Mb and you can insert memory card to expand the storage (MS Duo and SD/SDHC compatible) . The device has maximum shutter speed of 1/1500 sec and minimum of 2 sec. Sony DSC H200 is powered with AA Alkaline Batteries . The 3inch Lcd Display with 460 dots at the rear makes the device more approachable to user . Sony DSC H200 can record video upto 720p resolution in MP4 format and can capture still image at resolution of 20MP in jpg Format . The weight of the camera body is 430gram . 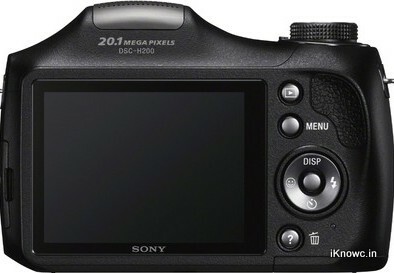 SONY DSC H200 has Aperture of f/3.1 – f/9.7 which is decent and has 35 mm Equivalent Focal Length – 24 – 633 mm . Mic for audio recording is Mono . The Built-in flash is located on the top of the desk . FUJIFILM FinePix S8400 comes with 44x Optical Zoom with Optical Image Stabilization . FUJIFILM FinePix S8400 16M BSI-CMOS High image Quality and Fast autofocus also can record Full HD Movie 1080i/60fps. FUJIFILM FinePix S8200comes with 42x Optical Zoom with Optical Image Stabilization . FUJIFILM FinePix S8200 has 16M BSI-CMOS High image Quality and Fast autofocus also can record Full HD Movie 1080i/60fps. FUJIFILM FinePix S8100 HAS 44x Optical Zoom with Optical Image Stabilization . FUJIFILM FinePix S8100 has 16M BSI-CMOS High image Quality and Fast autofocus also can record Full HD Movie 1080i/60fps. FUJIFILM FinePix S6800 with 30x Optical Zoom with Optical Image Stabilization . FUJIFILM FinePix S6800 has 16M BSI-CMOS High image Quality and Fast autofocus also can record Full HD Movie 1080i/60fps. To know more in Details about Sony DSC H200 Cyber Shot see sony site .